I have always loved the idea of home education and there have been times when I have contemplated it with Sophia, particularly as she is a very sensitive child. She has often struggled in the state primary school system and I’m sure she would thrive in a home schooled environment. I think however, that I would struggle to take on that challenge but have always admired those who do. Ross Mountney is one of those parents who did take on that challenge when both her and her husband took their 2 daughters out of their primary school to home educate them. 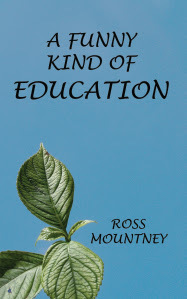 They thrived and Ross has written 2 books on her experience; 'A Funny Kind of Education' and 'Learning Without School' in addition to writing her blog, ‘Ross Mountney's Notebook’. 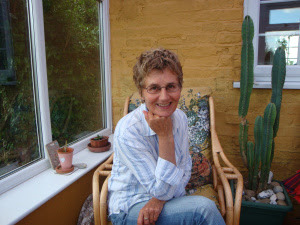 I’m thrilled that Charlie has given me the opportunity to tell you a little bit about home educating as it’s been such a natural and uplifting experience for us and worth considering. But I’m not advocating home education for all, just showing how this approach to learning can also be helpful to those who have school going children. We ended up home educating our two children after a short spell in Primary school because their desire to learn, and their good health, was increasingly destroyed there. The learning process in schools has become so stressful, both for teachers and children, we thought there must be another way – and there was. Thousands of families home educate in the UK and each has a slightly different approach to their children’s learning. But nearly all of those approaches tend to make use of the fact that children, through their natural curiosity about their world, have a very strong and inherent desire to learn, experiment and experience. And through providing lots of stimulation, activities, visits, outings, active play and interaction with others, that curiosity is preserved and becomes the motivation for them to learn all they need. They are then guided towards more formal learning as they progress. And families find that because of those relevant and stimulating experiences children accumulate all the skills and knowledge they need to go forward to a happy and productive life whether through work or further study at University. I appreciate it’s quite difficult for people to understand this, conditioned as we are to believe that children need classrooms, teachers, academic exercises and strict direction to learn anything. But actually they don’t. Take as an example all the things your child learnt to do at home with you pre-school just through your natural interaction with them, through talking to them about the things you see and do together, through your encouragement and support. They will have learnt how to walk, how to wash and dress themselves, use technology and tools, name things, behave appropriately – well, some of the time anyway! Through your natural connection with your child you will have taught them so much already about living in the world. When home educating, this natural process just becomes extended, eventually to incorporate skills and knowledge needed for more formal work or exams perhaps, or for going forward through other routes. One thing that home education does is really make you think seriously about what education is, which can sometimes be masked by the schooling process. Education is not simply for achieving lots of grades, although this might be a part. It is instead to enable a young person to lead a life in the world outside school and to do so they need to be stimulated to go on learning throughout all of their lives, as we all naturally do. Sadly the grade-getting tends to dull kids’ motivation for education or even to do anything sometimes. Learning in schools has become such a one-track process, rather than the more holistic development of a young person, their strengths and interests, their character and desires. But it is your character – knowing yourself well and what you can do – which takes you forward to a successful life. And to develop a rounded character you need rounded experiences, not single-track ones. Now you probably immediately think ‘what’s play got to do with education?’ But play is one of the most educative aspects of a child’s life. Through play children learn all sorts of skills; manipulative skills, language skills, thinking skills (essential for education), coordination, interaction, understanding of the properties of objects and materials, increased confidence, understanding of important concepts from science to maths. Play needs to be varied, in a variety of settings – many outdoors – and physically engaging. This is another activity whose importance is underestimated. Any creative activity develops thinking activity which in turn affects intelligence. Creative and imaginative play, any kind of art or craft work, with all sorts of materials especially those to hand (don’t just provide kits – be imaginative), building, model making, constructing, etc., stimulates the children to think, problem solve, invent and experiment, all valuable mental skills which aid academic ability later on. One of the most valuable tools to develop learning and understanding, speech and language development, is your child’s interaction with others and the conversations you can have with them. Chatting about what you see, what people are doing, what you’re buying, cooking, doing, posing questions (like; I wonder why/how that happened?) and answering their questions, all stimulates a child’s mind. A mind that’s stimulated is a mind that’s learning. Social occasions and family gatherings are great opportunities to engage and stimulate your children’s education through conversations. You don’t just need to get kids off the play station and moving about for their physical health. It is essential for their mental health too. In fact it affects their general well being. Physical activity improves blood flow to the brain and therefore helps stimulate the brain. It increases a child’s confidence, it improves moods and consequently behaviour, it lifts everyone’s spirits so it’s best to join in and make it a habitual part of your family life. Just as with social gatherings, outings and holidays provide the same opportunity to stimulate children through conversations and engaging them with their world. When they are engaged they’re going to be learning something. If they’re going somewhere new it’s the best experience of all. It doesn't have to cost anything; a park or a riverbank or city centre provide things to look at and talk about. You can just walk down a street, see plants in a wall or ants on a pavement, and observe and question. Sorry if I’m stating the obvious but kids learn about life from being engaged with life. Home educating families have the opportunity to engage their children in all the everyday activities that we need to do to lead a life and therefore children see how relevant learning is, how skills and knowledge empower them. They see how they need maths to budget their pocket money, they need language to text, they see the need to be able to read stuff, science is all around them all the time in; Why does that happen and how? The more you can involve your children in what you’re doing whether that’s choosing what’s for dinner (nutrition lesson), putting out the rubbish (lesson about the planet’s needs), going to work (the value of earning and contributing), cooking (science and maths) – the more they understand and the more they want to work for the life they want. Which is basically what education is for! These are the kinds of activities that home educators use to facilitate their children’s learning in a relevant and life-rich way and because of that the children continue to be engaged with education and learning and that’s why it’s so successful. It maintains a positive and relevant attitude to education and that’s the best thing you can give your children wherever they are educated. 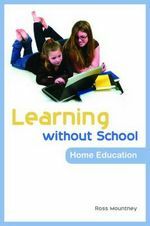 You can find lots more about the activities home educating families do with their children in my book ‘Learning Without School’. And for an entertaining story about how it worked for us read ‘A Funny Kind Of Education’. For details, extracts, and other information visit my website: www.rossmountney.wordpress.com. And whichever path you choose; enjoy your children and enjoy your journey into their education. Flexi-schooling is when you send your child to school part time and homeschool the rest of the time. The government is sadly trying to stop it being allowed in mainstream schools(hopefully they won't) but independent schools especially Steiner/Waldorf schools welcome it. I read Ross' book Learning Without School as we were about to start Home Schooling (due to travel plans). I must say before I read her book I was really worried about what to do and my mind was very fuddled. About a chapter in and I began to relax. So far the home-schooling has been fun and great for all of us. Thanks for the great post.